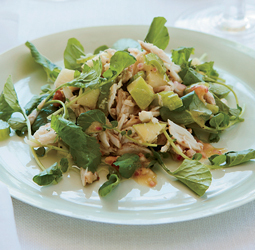 Crab, Apple and Watercress Salad with Walnut Vinaigrette - A recipe from Savor California, the online showcase for extraordinary gourmet foods and beverages from California. Recipe by Melissa Rubel and provided by Food & Wine magazine. Photo by Petrina Tinslay. In a medium bowl, toss the watercress with 3 tablespoons of the dressing. In another medium bowl, gently toss the crab with the celery, apple, walnuts and the remaining dressing. Season with salt and pepper. Transfer the watercress to plates, top with the crab salad and serve. * Note: Lump crab is sold precooked, so it's perfect for a fast meal.